ER&DCI Institute of Technology bring forth our flagship event Techfiesta 2K19 scheduled on 3rd & 4th of May, designed to promote out of the box thinking, knowledge and skills. Two days technical celebration comprises of HAXXWORKS'19 and VESQRIOZ'19 organized by Dept. of CSE and Dept. of ECE. HAXXWORKS’19 is a two day extravaganza conducted by Dept. of Computer Science & Engineering. The event includes a workshop ‘Hacking 101’ and a Capture the Flag (CTF) competition with prizes worth 7K. All hack brains are welcome to attend the event. Day 1: “Hacking 101”: A hands-on session on the basics of ethical hacking and CTF. How to be an “Ethical Hacker”? Career opportunities in the field of Cyber Security. A team can have 2 or 3 members. Attempting to gain access to any other systems during the competition will lead to disqualification. The event will span over 6 hours. Target audience: PG/UG scholars (MCA/ M.Tech / BCA/B.Tech). 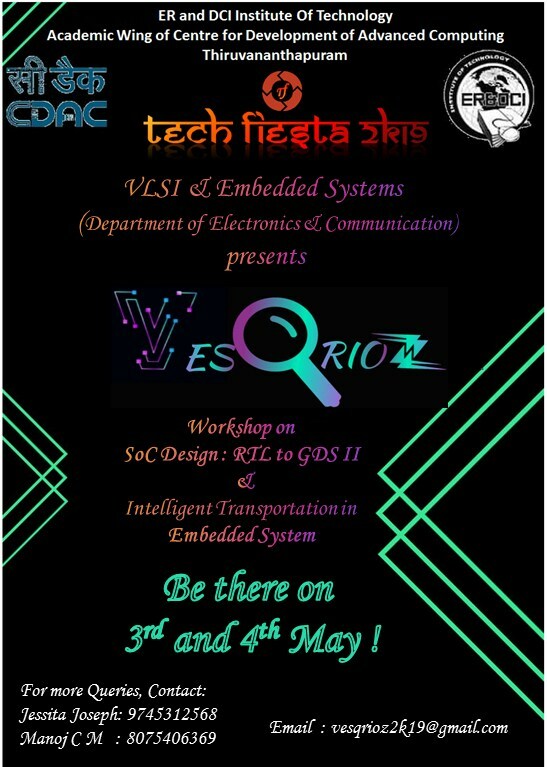 Dept of Electronics and Communication presents VesQrioz’19. This event consists of a two day workshop that focuses on electronic product design (Embedded product design and System on Chip (SoC) design). Have you ever wondered how an SoC is designed? If yes, then this workshop will give you a glimpse on various stages of SoC design with hands on session. Design: Hardware description language (HDL) based logic device design using Questa Sim.